The GOP will be able to hit a HOMERUN on taxes if the tax increase happen in 2011. In 1981, Ronald Reagan—with bipartisan support—began the first phase in a series of tax cuts passed under the Economic Recovery Tax Act (ERTA), whereby the bulk of the tax cuts didn’t take effect until Jan. 1, 1983. Reagan’s delayed tax cuts were the mirror image of President Barack Obama’s delayed tax rate increases. For 1981 and 1982 people deferred so much economic activity that real GDP was basically flat (i.e., no growth), and the unemployment rate rose to well over 10%. Consider corporate profits as a share of GDP. Today, corporate profits as a share of GDP are way too high given the state of the U.S. economy. These high profits reflect the shift in income into 2010 from 2011. These profits will tumble in 2011, preceded most likely by the stock market. The result will be a crash in tax receipts once the surge is past. If you thought deficits and unemployment have been bad lately, you ain’t seen nothing yet. More from Arthur Laffer @ the Wall Street Journal…..
Daniel…….South Dakota Senate: Filling closed yesterday in South Dakota and Senator John Thune (R-SD) is running UNOPPOSED…..is he going for the WH in 2012? The Filling Deadline closed yesterday in the State of South Dakota. 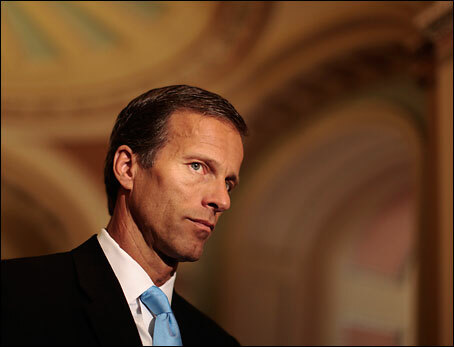 Democrats WERE UNABLE to field a Candidate which means Incumbent Senator John Thune (R-SD) will UNOPPOSED this Fall. Chris Cilizza of the “The Fix” examined and accessed Thune’s Chances for a Potential Presidential Bid against President Barack Obama (D) yesterday evening. Today’s candidate filing deadline in South Dakota marks the start of serious talk about Sen. John Thune‘s potential presidential campaign in 2012. The Thune forces have been loathe to discuss his potential 2012 candidacy while there was still a possibility — albeit it a VERY slim one — that he could draw a serious Democratic challenge for his re-election race this fall. He will also likely begin to do more for candidates running for office in 2010 via his Heartland Values PAC — a process that will allow him to visit key early primary and caucus states to gauge support. 5 Reasons why Romney’s Political Career isn’t Dead……. In politics, it’s very easy to predict the future. Doing it accurately is near impossible. 5 Reasons why Romney's Political Career isn't Dead……. Has Mitt Romney’s history tied him to Healthcare? A lot of people don’t know the fact that Massachusetts under Romney’s governorship had a comprehensive healthcare program put into place…..While Romeny was Governor the program was trend setting…..Now Romeny has come out forcefully against the just passed Federal Healthcare Bill……Hummmmm? In the days immediately before and after passage of the landmark health care reform bill, Mitt Romney responded so forcefully as to suggest his own political fate is tied to the new law. Just as health care, or “Obamacare,” as it is derided on the right, hangs over this year’s midterm elections, it is already casting a shadow on the 2012 presidential contest — and its GOP front-runner. What was once thought to be an asset for Romney, his passage as Massachusetts governor of a health care mandate for the state’s residents, now poses a potentially serious threat to his White House hopes. The prospect of a larger government role in health care has become so toxic among conservatives that Romney’s principal calling card from his Beacon Hill tenure has become something he’s now defending rather than touting. While the first primary contest of the presidential race is still just under two years away, and Romney hasn’t officially made his intentions known, the quandary has already become reminiscent of the predicament then-Sen. Hillary Clinton grappled with in the run-up to the 2008 race. Having supported the 2002 congressional resolution that the Democratic Party’s base viewed as giving President Bush a free hand to invade Iraq, Clinton and her top advisers spent years debating how to address what became a definitional issue in the primary. Has Mitt Romney's history tied him to Healthcare?